Four former care home workers who ‘systematically’ verbally abused a dementia sufferer in their care have been jailed. Nicole Howley, Barbara Holcroft, Joanne Fisher and Chloe Pearsall subjected one pensioner to humiliating abuse while working at the Bupa run Wentworth Croft Care Home in Bretton 2013. They told the woman she was living in a brothel, and should expect male visitors. Howley also told another woman, now aged 92, who also suffered from dementia she would be killed at 3pm. 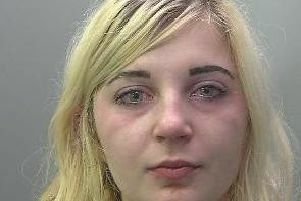 On Wednesday Howley was jailed for two years, while her three former colleagues were locked up for nine months at Peterborough Crown Court. They had been found guilty at a trial at Peterborough Magistrates’ Court earlier this year. Judge Sean Enright, said he had ‘put aside his own personal revulsion’ to find a ‘just, proportionate’ sentence. Craig McDougall, prosecuting, said both victims had such severe dementia that they often did not know where they were, and found it difficult to hold conversations. Andrew Hurst, defending all four women, said they continue to deny the offences, and some had received abuse online following the convictions. He said: “None of these women have any previous convictions recorded against them. A spokesman for Wentworth Croft Care Home said: “Everyone at the home is deeply shocked by the deplorable behaviour of these experienced carers. “The actions of these individuals in 2013 do not reflect the home or the committed people who work here. “Our people used our whistle-blowing system to raise concerns and we acted immediately, by suspending these individuals and calling in the police. DC Kevin Sutcliffe, who investigated, said: “We take all allegations of abuse of vulnerable people very seriously and have worked closely with partner agencies to investigate this case and safeguard those in care at the premises. “Families of victims and potential victims were visited and kept fully aware of the investigation. Fisher (36) of Axiom Avenue, Peterborough, Holcroft (63) of Lincoln Road, Peterborough and Pearsall (26) of Newport Way, Peterborough, were all convicted of one count of ‘carer ill treat a person under the mental capacity act’. Howley (25) of Sycamore Avenue, Peterborough, was found guilty of two counts of the same charge. All four were dismissed from their jobs in February last year.